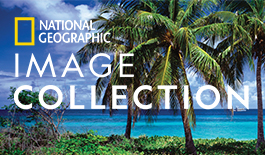 The National Geographic Image Collection owns one of the most comprehensive and unique collections of photographs and original artwork in the world. Our collection contains more than 10 million transparencies, black-and-white prints, glass plates, and pieces of original art. No matter what your image needs, you can be sure there's no more dramatic, no more accurate representation of the subject matter than images from National Geographic. Our photographs are real. They have a unique ability to make people gasp, frown, smile, weep. They make people think. Above all, they make people react. Now you can lend this impact to your projects with images from the National Geographic.